Easter preparations are in full swing in the Runcible Kitchen here. 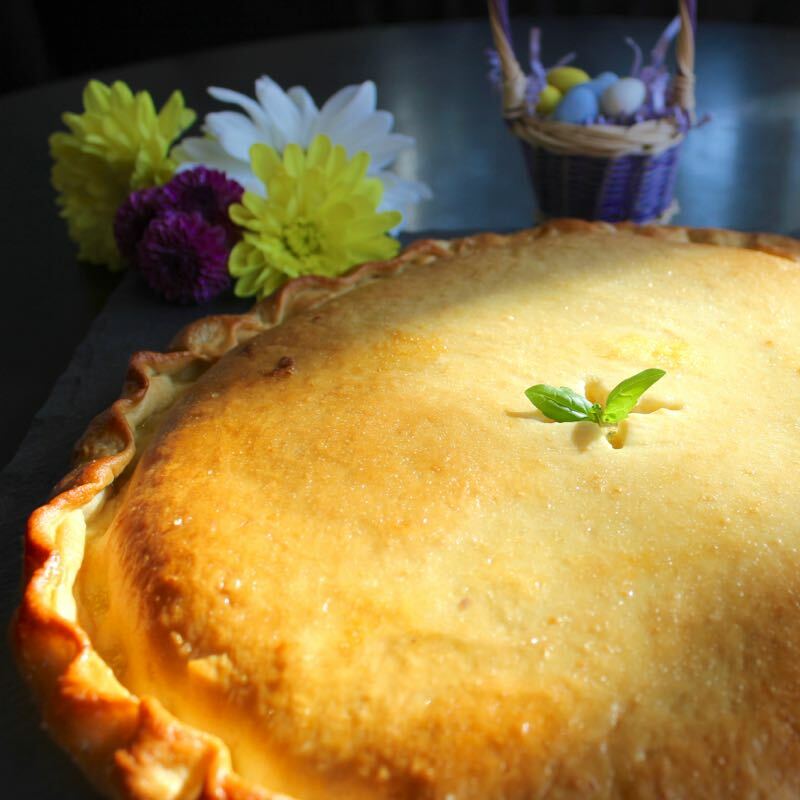 And the star of the show is this Italian Easter Pie! Yesterday I made my traditional Apple & Cinnamon Hot Cross Buns. Good Friday just wouldn’t be the same without them! And as for today, it was time to try out a new recipe. And I think this one will be making frequent reappearances. 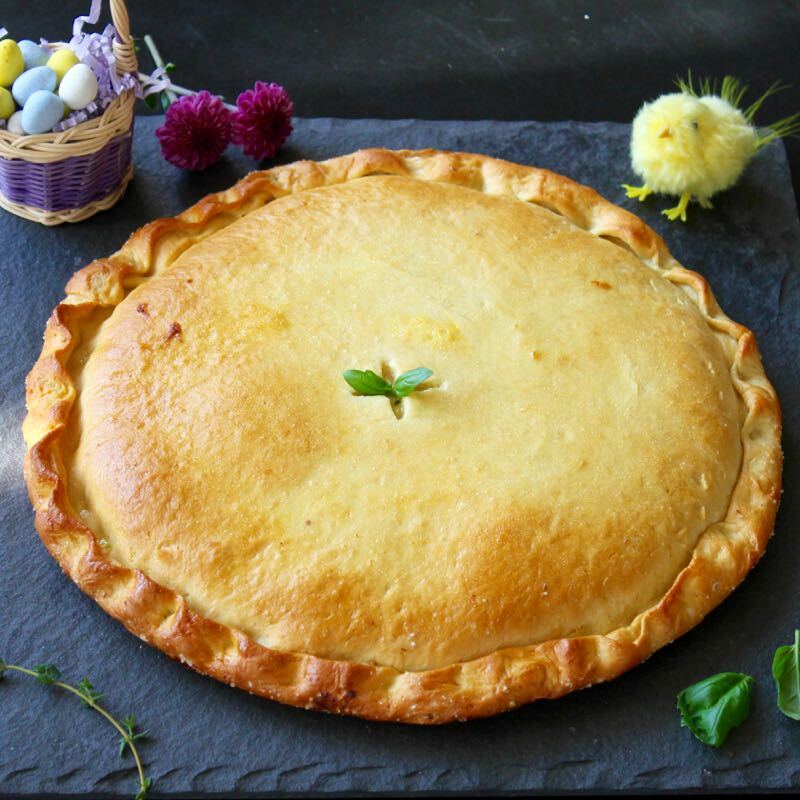 Behold this fantastic Italian Easter Pie! What we’ve got here is basically an Easter Calzone or “stuffed pizza” filled with smoked ham, hard-boiled eggs and cheese. 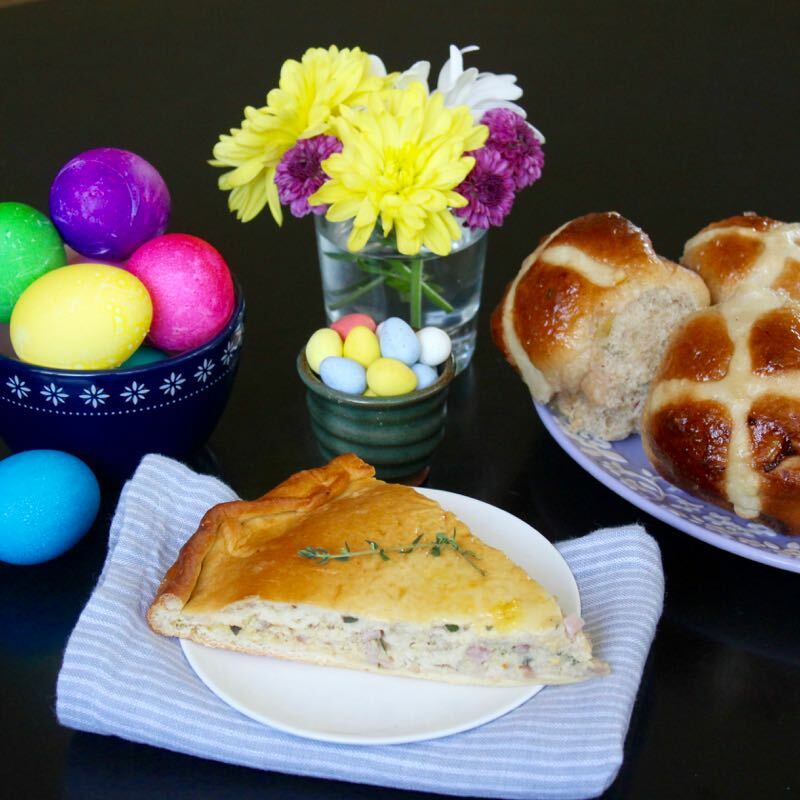 Traditionally it is eaten in Italian households the day before Easter, but would certainly be welcome on any Easter Brunch table and would also be a great recipe to keep on hand should you have any extra hard-boiled eggs lingering around after the holiday. I was very happy with how this Easter treat turned out. The crust is light and thin, and I will mention that the Italian Style flour was really easy to work with and roll out. The savory filling was perfect, hearty yet not heavy or dense. 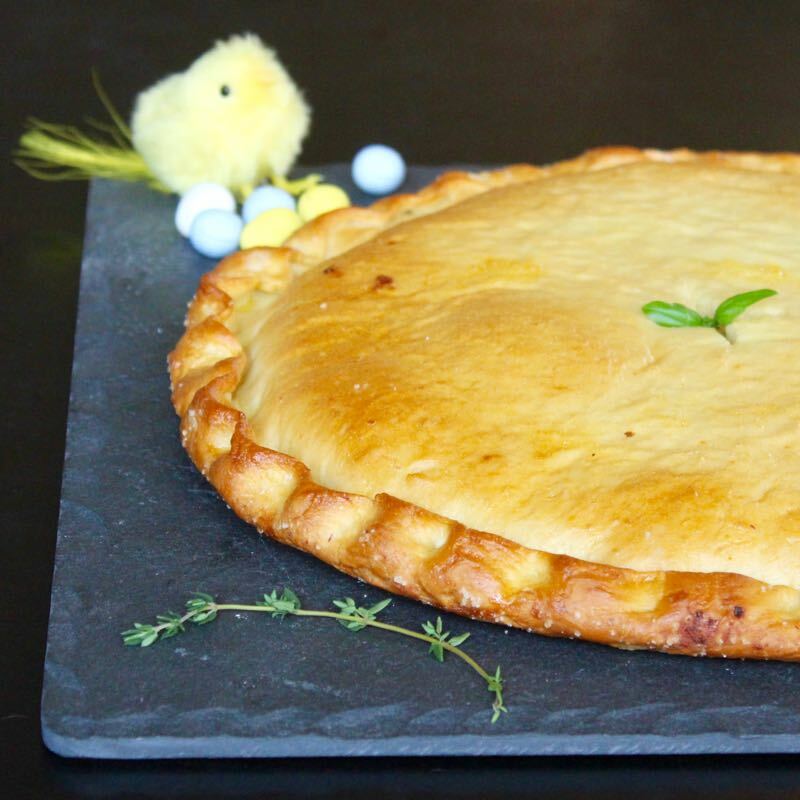 Italian Easter Pie is generally served warm or at room temperature. And though it is usually enjoyed for brunch or breakfast, I think it would also be great for dinner along with a side salad. 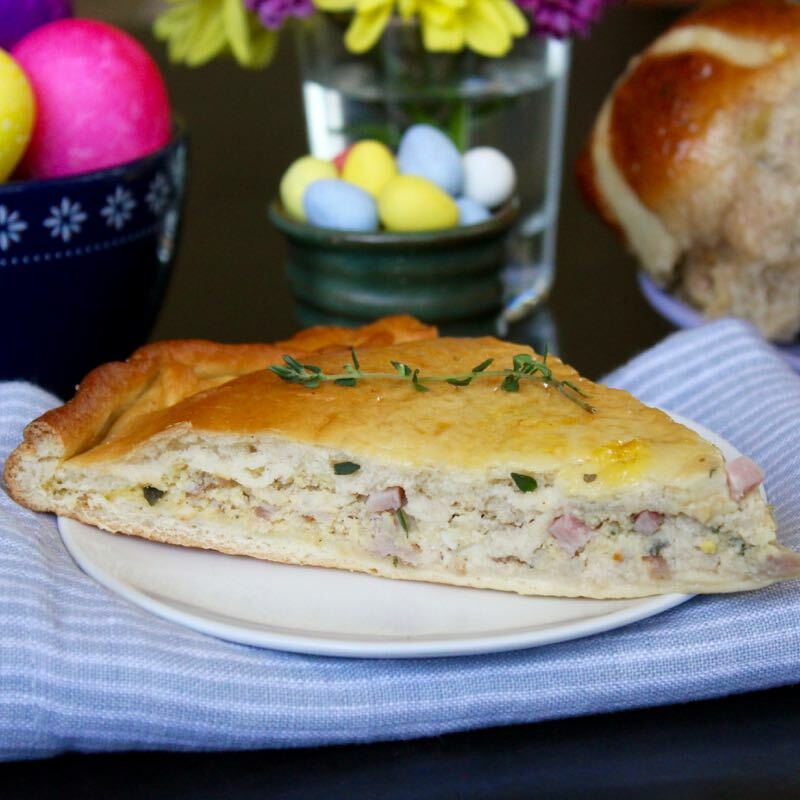 Rustic, homey and delicious, this Italian Easter Pie would be perfect for all of your Easter holiday celebrations! Mix and knead together all of the dough ingredients — by hand, in a mixer, or in a bread machine — until you’ve made a soft, smooth dough. Place the dough in a lightly greased bowl, cover, and allow it to rise for 1 to 2 hours, until it’s quite puffy, nearly doubled in bulk. While the dough is rising, make the filling. Hard-boil and peel 6 of the eggs. Place the hard-boiled eggs, ham (cut in chunks), and fresh thyme in the work bowl of a food processor. Process until chopped and combined. Don’t over-process; the ham and eggs should still be a bit chunky. You can also simply dice the eggs and ham, and chop the thyme, if you don’t have a food processor. Combine the ham, boiled eggs, and thyme with the raw eggs, ricotta, and Parmesan. Season to taste with salt and about 1/2 teaspoon coarsely ground black pepper. Add the Pasta Sprinkle if you are using it. Deflate the dough, and divide it into four pieces. Roll two of the dough pieces into rounds about 13″ in diameter, and place them on lightly greased or parchment-lined 12″ pizza pans. Or roll into ovals about 10″ x 14″, and place on two lightly greased or parchment-lined baking sheets. Note: If you’re using parchment, it’s easiest to roll right on the parchment, then lift the crusts, parchment and all, onto the pans. I actually baked these pies on a pizza stone which I preheated in the oven. So I simply rolled the crusts out and assembled the pies on parchment paper. Then I transferred the pies to the heated stone on a pizza peel or paddle. Divide the filling evenly between the two crusts, covering them to within 1″ of their edges. You’ll use a generous 3 cups (about 27 ounces) for each crust. Roll out the other two pieces of dough, and place them atop the filled crusts, gently stretching them, if necessary, to cover the filling. Seal the crust edges by rolling the bottom crust up over the top, and pinching together. 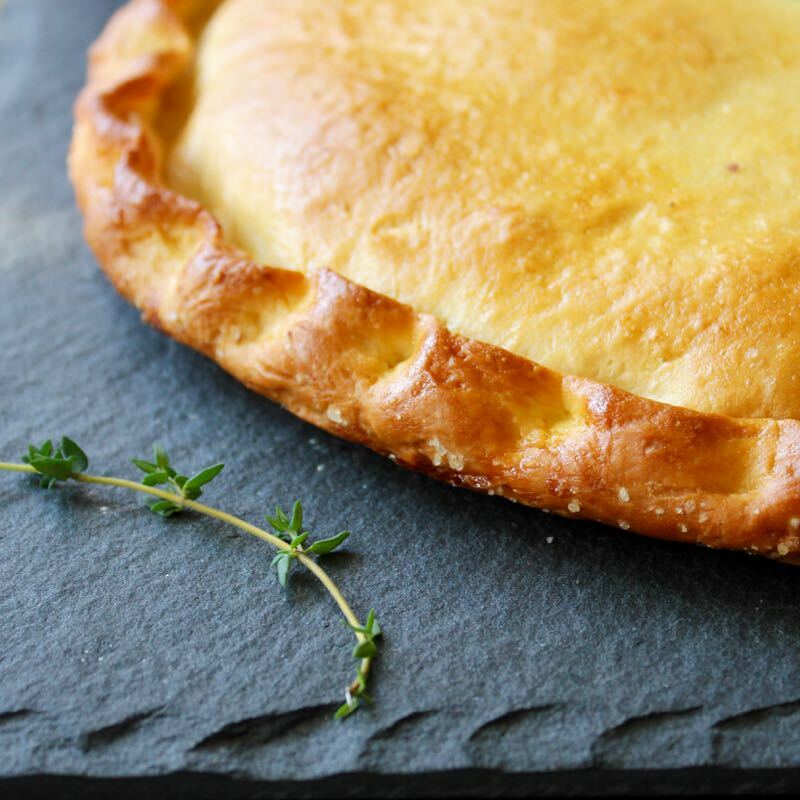 Using a sharp knife or pair of scissors, cut a 1″ hole in the very center of each top crust; this will allow steam to escape. Make the topping by whisking together the egg and sugar until the sugar has dissolved. Paint each crust with some of the topping; this will yield a golden brown, shiny crust with mildly sweet flavor, a perfect foil for the salty ham. Sprinkle flaky sea salt on the rolled edge of the dough. Allow the pies to rest while you preheat your oven to 350°F, about 15 minutes. They don’t need to be covered. Bake the pies for about 25 – 35 minutes, until they’re a deep, golden brown. Remove them from the oven, and carefully slide them off the pan/parchment and onto on a rack to cool. Serve warm or at room temperature. Refrigerate any leftovers. I should also mention that King Arthur Flour has a wonderful shop full of kitchen essentials as well as their quality ingredients on their website. Definitely worth taking a peek!